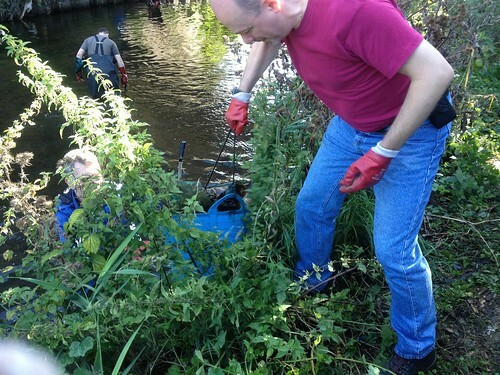 I'm glad so say I've managed to make every possible Wandle Trust clean-up this year (weekends away excepting). I was bank-side helping relay the rubbish to the waiting van. My inner cave-man would like to be in the water heave-ho-ing stuff out of the mud but teamwork requires a balance of volunteers land-side as well - so I was happy with that. 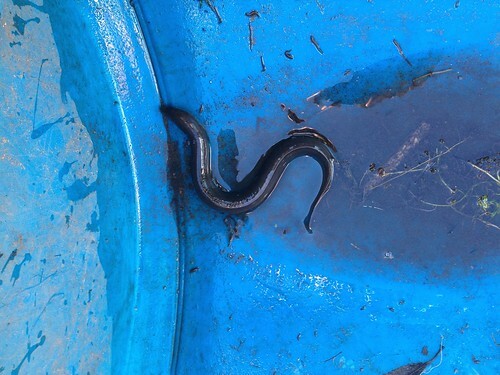 We always keep an eel tally; they hide in all manner of containers so you have to check if there are any lurkers in tyres, pipes and tins. I guess it is an indicator of water quality and aquatic life generally. Right toward the end we found a safe with its door off. Presumably the detritus of some past crime. 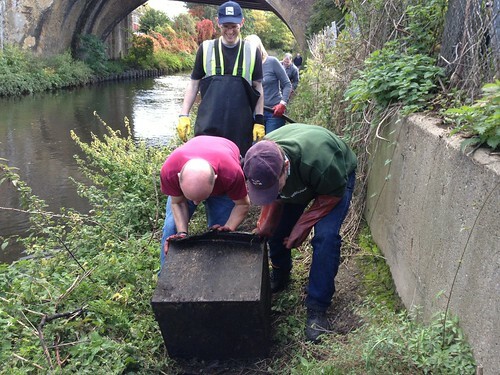 It was quite an effort to roll it along the bank; it was far too heavy to lift and carry. Well supervised by Andy here! So good eco-deed done for another month. 20121014-wandle, a set on Flickr.